Being part of the ‘Team Graphics32‘, I was mostly responsible for the version 1.9.1 update, that introduced SSE2 optimizations and 64-Bit support, along with better support for Lazarus (in particular under OSX). Since I have reviewed a large part of the optimized blend code, I am now skilled in this area. So if you have questions/suggestions/issues about this part of the library, feel free to ask for support (in this particular scope). I also created the GR32 PNG library, that allows to read, write and transcode PNG files using the optimized code from the GR32 library. Hence the limitations of the Graphics32 library to only support 32bit bitmaps, the PNG code is very flexible to transcode into any desired format with nearly any available option, that is supported in the PNG specification. 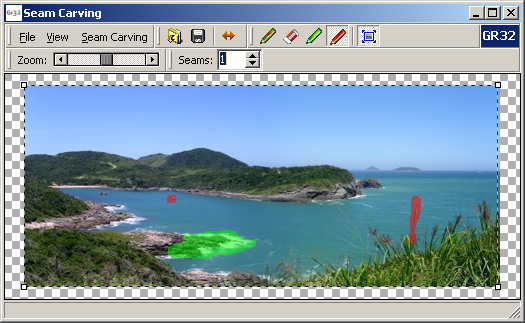 Recently I also wrote an implementation of seam carving, that uses the Graphics32 library. It is written in a way that it can easily be used with existing code and allows to rescale images non-uniformly (i.e. to different ratios for the two dimensions). While the development turned out to be a dead-end for my personal needs, I decided to develop this further, since I believe others may find this quite useful. However, since the development cost precious time, I can’t just release the code as open source until I have funds for this. So for now I can only release a lite version, which does not contain any optimizations nor comments. Also masks (for preservation or removal of certain areas) are not supported in this release. The teaser (with masks) and the lite code with example are already available. Everyone who decides to donate for the project will receive the full code immediately. If more than 500€ have been donated (currently it’s 0 €) I promise to release the library in the wild for public use. With the recent additions to Graphics32 vector graphics got very easy and with this trivial graphic tasks can be completed in no time. As an example I created a small demo project for symmetrical identicons which can encode a 32bit value.